I want to find the locked and free temprory table instances by query. After an AE goes to Success is their any way to find which temp table insatance that process used. That is recorded in PS_AETEMPTBLMGR. Hi David, great blog post as usual however I wonder if you could clarify something for me. On seeing this I thought perhaps the first x number of instances for online AEs were created without the PROCESS_INSTANCE column and therefore full rebuild of TAOs was required due to the different table structure used for AEs run via CallApEngine, but I see the TAO structures are all identical. My query therefore is why can the operation not be done via the following procedure rather than rebuilding all the TAOs as oracle state? Is there something I'm missing in the whole process? I thought we could just create the additional n TAO instances via above procedure and then increase online temp instances by n.
Daryn, it’s a Catch-22 situation. 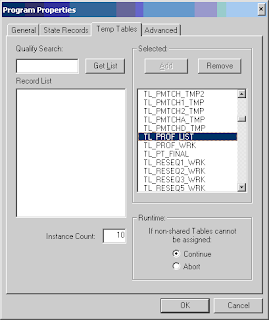 You cannot build the extra tables with Application Designer until you have increased the number of temporary table instances, and as soon as you increase the number of temporary table instances, an Application Engine initiated by the Process Scheduler will assume the tables have been created and will attempt to use them if necessary. Remember that the number of on-line temporary table instances is applied to every temporary record in the database. In Financials, you will have thousands of tables to build across all modules, whether you use the module or not. So you can really only manage this with Application Designer. If you are using stand-alone PSAE processes the change is recognised immediately, but if you are using PSAESRV server processes it will be picked up as the server processes recycle, or when the scheduler is restarted. Similarly the new on-line temporary table instances will be used as application server processes recycle, or when the application server is restarted. A similar problem exists with the number of non-shared temporary tables used by a scheduled Application Engine program, but that setting is an attribute of the Application Engine program and is migrated with Application Designer. 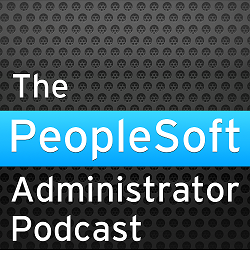 The problem is how avoid a production outage rather than in a development or test system. 4. Increase the number of on-line temporary table instances. 5. As a final test, try to build the create table script again with Application Designer. If this doesn’t create any tables then the process worked successfully.